The 5th International Congress on Water, Waste and Energy Management (WWEM-19) is organized by academics and researchers belonging to different scientific areas of the University Complutense of Madrid, University Carlos III of Madrid, University of Extremadura and University of Las Palmas de Gran Canaria with the technical support of Sciknowledge European Conferences. This event will include the participation of renowned keynote speakers, oral presentations, posters sessions and technical conferences related to the topics dealt with in the Scientific Program as well as an attractive social and cultural program. 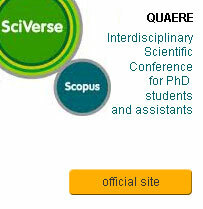 All accepted papers will be published in the Abstract E-book of the Conference. Those communications considered of having enough quality can be further considered for publication in the International Conference Journals. At the authors’ choice, those works not suitable for publication in any of the congress journals will be published in the Extended Proceedings E-book of the International Congress. The Conference will also have a space for companies and/or institutions to present their products, services, innovations and research results. If you or your company is interested in participating of this exhibition, please contact the Technical Secretariat here. Finally, on behalf of the Organizing Committee, I would like to invite all the Scientific Community to participate in this project, presenting papers or communications related to any of the proposed topics. Looking forward to welcoming you in París!